This month we are continuing with our economy theme. In the last issue we looked at what you might buy for around £1,000. But, imagine your budget was limited to £100 or thereabouts – how far might that go? Well, of course, you could look around for well used second-hand Baikals, but another group of guns immediately springs to mind, box-lock non-ejectors. Now, you could take the risk of buying an English gun at auction – and, you will find dozens on offer within budget. Or, you could consider one of the best proven workhorses around – the AyA Yeoman. I have seen these on sale for as little as fifty quid recently in good mechanical condition, albeit with a little superficial wear and tear usually in evidence. Why go for a Spanish gun rather than an English gun of character? Well, if you can find an English boxlock in a good state at the right money all well and good; they are a great bargain at the moment. BUT, caveat emptor, many of the cheap (and not so cheap) guns you will have issues – cracked stocks, thin barrels, near to limit proof, 2 1/2" chambers, lifting ribs, loose jointing, etc. etc. The problem is that it is not cost effective to repair them any more unless they have sentimental value. On the other hand, my experience of the AyA Yeoman is that, like a Baikal, it is as tough as a Baltic trawler-man. They seem to go on and on, which does not mean that you shouldn't have the one you may find checked out by a competent gunsmith, of course, I advise that you do, and that applies to any second-hand gun. But, for reasons, I am not sure of I have found Yeoman's to be particularly long lived, they don't seem to come off the face like lighter English guns, nor do they get their barrels dented as easily (because they are thicker – arguably a negative for handling, but a positive if the gun is knocking around in the back of a Landy). I have a sentimental attachment to Yeomans too. I started my serious shotgunning career with a non-ejector side by side – not an AYA – as many people did a generation ago. I had had all sorts of air-guns, a 9mm Webley and .410s before. Then, whilst struggling with a Mossberg bolt action 12 – and struggle I did – I spent a year lusting after an AyA Yeoman in the window of a local saddlers in Sevenoaks. As it transpired, I ended up with a cheap English boxlock 12 bore non-ejector instead, but I always remember that then shiny new and exciting Yeoman which was in all the gun magazines of the time. I think it was priced at £39. 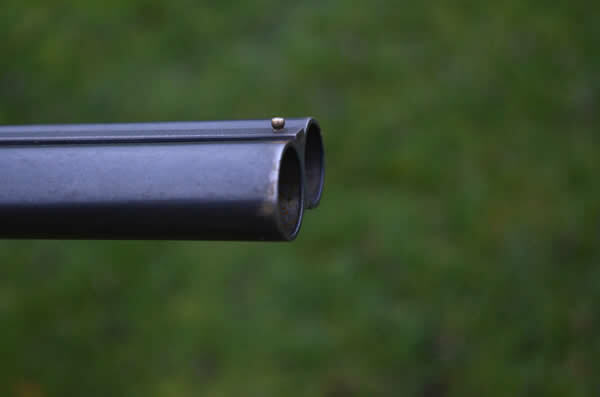 In the words of Edward King the MD of ASI who import and helped to develop AyA guns for the British market: "For many people in the 1960s or 70s it was the first new gun they could afford, many keepers and pest controllers bought them and stuffed all sorts of ammunition through them. I have never seen one come off the face, it just has a very solid action, remarkably so. They still offer remarkable value when bought second-hand today. We get them in occasionally, but not much goes wrong with them." In the pursuit of the most bang for the least buck I went searching for a well used Yeoman, and it did not take me long to find a good working specimen. It was resting on the shelf of my friend Eddie Whyte's gun rack at his Naul Clay pigeon shooting club just outside Dublin (an establishment place I frequently visit because of the great hospitality). I might also note that the Irish, being sensible sportsmen who still go rough shooting put a slightly higher price on this sort of gun than us spoilt lot on the other side of the water do – but not much! I suspect Eddie would have parted with his for a couple hundred quid.). What was it like? 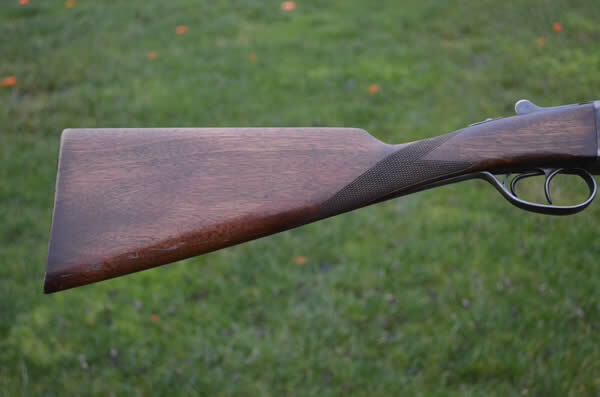 Well, in form it was a classic side by side double trigger game gun with straight-hand stock and splinter forend. The wood was average, varnish finished, but the shapes of the stock were adequate, quite good in fact. As for decoration, it's as plain as a pikestaff. What do you expect! There was still quite a lot of (rather attractive) colour on the Anson and Deeley style action, however. 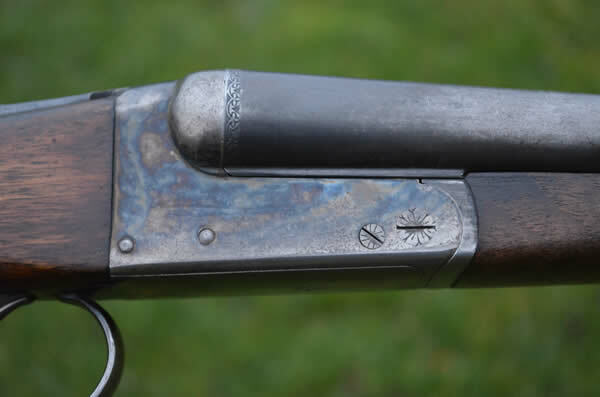 The only engraving you get is on the (detachable) hinge pin and around the mouths of the chambers at the breech end of the barrels. It all looks fine, though, quite business-like in its way. 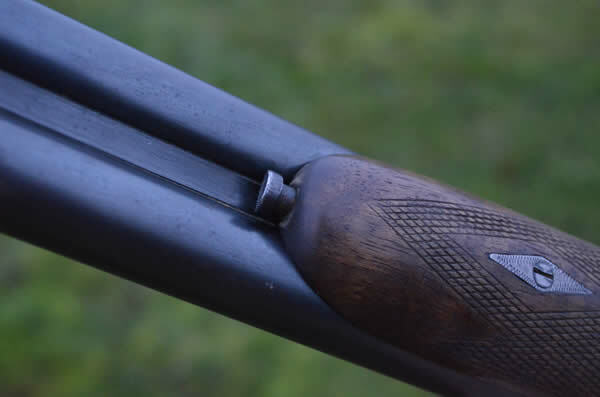 The top lever and safety are well shaped (indeed, I especially like the Purdey style 'button' on the safety thumb-piece – easy to use with wet hands or on cold days). Generally, the ergonomics of the gun are good (which together with its reliability account for its extraordinary success). The plain extractors are no problem unless you are on a driven shoot, and ideal for walking up or wildfowling where you may want to pocket your empties. They are a boon when clay busting too – and the gun is perfectly suitable for a bit of informal pitch disk practice (upon which more shortly). How does it shoot? Well, it's not a Holland & Holland and the trigger pulls are pretty grim and the stock a little low (measuring about 2 1/4" at heel), but shoot it does. Eddie and I went round his testing sporting layout and both managed to whack some really tough FITASC style birds with the old AyA just for the craic. I tried it on a variety of other birds without issue. For walking up or pigeon shooting it is perfectly adequate and... well... cheap as chips. The best bargain out there? Yes, the Yeoman probably is. I doubt if you can wear one out.